The most important step in rug cleaning occurs before the cleaning process begins. This process is the pre-cleaning inspection of the rug. We can’t always catch every problem in advance – we will have “surprises” – but be detailed in your documentation. Establish the condition of the rug prior to cleaning and record it. The recording will require an inspection report. This is similar to what is done when cleaning upholstery and wall-to-wall carpet. All pre-existing problems with the rug need to be documented, with a copy provided to the customer. We want to explain to the customer their problems before cleaning – not give them excuses after cleaning. To begin, establish an approximate value and record it on the client’s receipt. As a general rule, machine-made rugs will decrease in value, similar to an automobile. If the condition is not good, often the value will be approximately equal to the cost of cleaning. If you are new to rug cleaning and do not have a sense of rug value, ask the customer to establish a value. 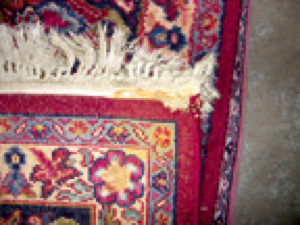 This may help to limit potential liability if a customer would claim you damaged her rug. The next step is to establish the condition of the rug prior to cleaning on your inspection document. It is necessary for the rug specialist to know possible problems that can arise during cleaning. The new IICRC Rug Cleaning Technician class covers more than 50 items to look for, as does the ASCR three-day Rug School. The following are a few key items. Rug identification is where the process begins. This comes from experience. It won’t matter if I tell you to watch out for Pakistani Bokhara rugs because they often bleed or for Chinese needlepoint rugs as they may have cartoon markings if you do not know what these rugs look like. Attending a rug training course will help in this area. 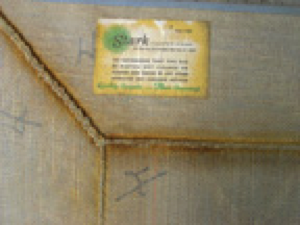 Advanced rug identification is covered in the ASCR Certified Rug Specialists course. The first step is to determine if the rug is machine-made or hand-made. We will discuss certain problems of machine-made rugs in this article, and cover hand-knotted rugs next time. The key to determining machine-made vs. hand-knotted is to look at the back of the rug for the thin white warp yarns that run the length of the rug(Image 1). 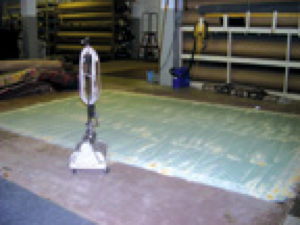 Machine-woven rugs can be manufactured on a Wilton or Axminster loom. Both will show the warp yarns. Often, a machine-made rug will have a label that will give country of origin and other information. Just because a rug is machine-woven does not tell you it is inexpensive. Wilton-woven border rugs from Stark Carpet (Image 2) or Edward Fields can be very expensive. When Wilton-woven border rugs are wet-cleaned, they may shrink. Even the slightest shrinkage will cause buckling. This is because the warps of the rug field are at a right angle to the attached borders. Once shrinkage has occurred, the only way to correct the problem is to take the rug apart and re-assemble it or try to block the rug. If you do not have repair capabilities in your company, limit your cleaning method to absorbent compound (Image 3). Manufacturer or stencil marks can result in a real “surprise.” Rugs from China or India that are tufted or stitched into a backing material may have the design drawn or stenciled on this foundation material. Careful inspection will not always reveal this hidden problem. Once cleaning has resulted in revealing this problem it is often too late to correct it (Image 4). 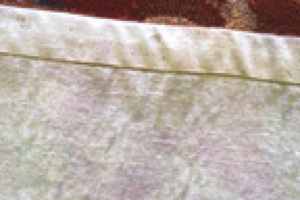 When you see rugs with this type of foundation material (Image 5), the rug should be dried flat and face down, so any wicking dye bleed will go to the rug back and not be visible when the rug is returned to your customer’s home. 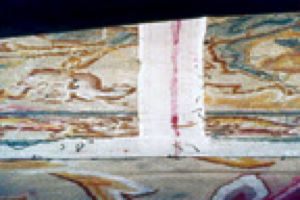 This type of rug construction can include rugs with a backing material glued to the rug, as in Image 5. The latex used often is full of marble dust (calcium carbonate), which is filler much like gravel is used in concrete. As the filler breaks down, you will see “sand” under the rug. This is a sign the rug is delaminating. The wool face yarns can outlive the cheap latex used in these rugs. Even if you do not see delamination, write it down, as you will often find it after cleaning. Another persistent problem with these hand-tufted or hand-gunned rugs is the latex, which is not properly cured during the manufacturing process. As a result, the rugs have a peculiar smell. This odor may be noticed when the rug is new, after it has been in the home for a period of time, or after cleaning. I do not know of a process to correct this odor issue that is consistently successful. Next time we will look at and knotted-rugs and some key problems to look for.